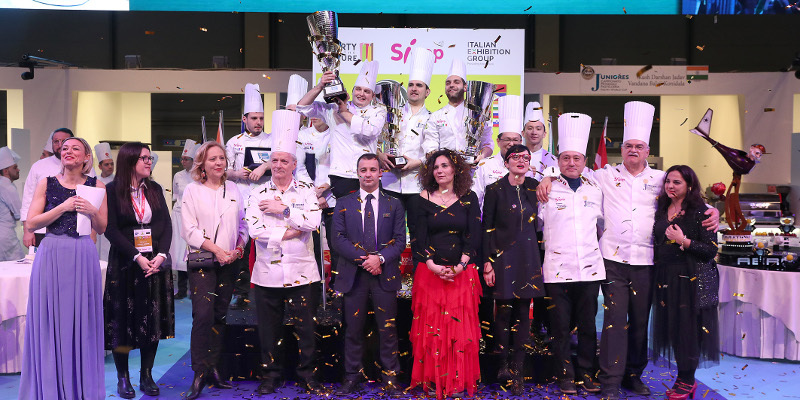 SIGEP 2019At the 40th edition of SIGEP, the Italians Filippo Valsecchi (Lecco) and Vincenzo Donnarumma (Naples), trained by the pastry chef Davide Milizia, won the Junior Pastry World Cup. At the Pastry Arena set up at Rimini expo centre, eleven under-23 young pastry chefs from all over the world competed on the first two days of SIGEP. Among the contestants there were teams from Australia, China, Croatia, the Philippines, France, India, Italy, Russia, Singapore, Slovenia and Taiwan. The Junior Pastry World Cup had ”Flight” as its theme and each contestant, supported by their respective team, expressed technique and creativity in the seven tests foreseen. “A top-grade competition, with well prepared professional youngsters. Ten years ago, when we began, this type of skill didn’t exist”, comments Roberto Rinaldini, master pastry chef and creator of the Junior Pastry World Cup. “Competition always helps to grow, particularly in the case of youngsters. Competing, and thus sharing knowledge, is very helpful. This was a beautiful edition of the Cup, and congratulations go to all concerned – keep on like this. The important thing is to remain closely united in the promotion of this Italian-made product, which has all it takes to lead the world,” comments Master pastry chef Iginio Massari.